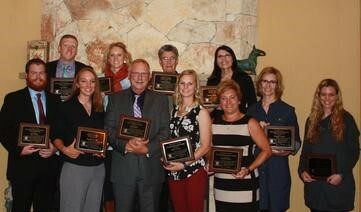 PUEBLO - A Colorado State University-Pueblo faculty member received the Outstanding Higher Education Teacher of the Year Award from SHAPE Colorado, an organization committed to advocating for quality physical education, health education, and physical activity resources. 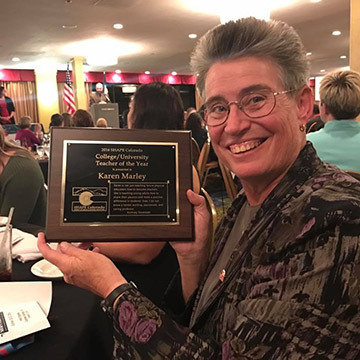 Karen Marley, a lecturer in the Department of Exercise Science, Health Promotion, and Recreation, accepted the honor at the 2017 SHAPE Colorado convention held Oct. 19-21 in Colorado Springs. Founded in 1933, SHAPE Colorado (formerly the Colorado Association for Health, PE, Recreation and Dance) is a non-profit professional organization committed to educating children and adults about health and physical activity and is comprised of more than 500 committed professional and future professionals, mostly physical education and health teachers from across the state of Colorado (www.shapeco.org). Marley has been a faculty member in the Department of Exercise Science Health Promotion and Recreation since 2008, where she teachers a variety of courses from motor learning and development to fundamentals of coaching and officiating and facility design. For more than 30 years, she has taught at all levels and has been a significant presence in the sport of field hockey. She is a past president of SHAPE Colorado, served as the CHSAA Field Hockey Committee Chair, and was President of National Council for The Accreditation of Coaches Education in 2004. "I am honored and humbled to be recognized by my students for the passion I put into teaching. If I can make my students better teachers by showing my passion and sharing my enthusiasm, I have done my job," Marley said. "I love what I do and love my colleagues, who all are committed to sharing experiences that help our students." According to SHAPE, Marley "shows her commitment to student learning by implementing a teaching style and practice that stimulates the minds of student-athletes, traditional and non-traditional students alike. She shows the utmost respect to the diversity of all learners and learning styles." Marley also has received the national Pathfinder award for her passion and promotion of the sport of Field Hockey. Current student Kortney Sorenson said, "Karen does so much more for us than teach lessons in a classroom. She shares her passion for physical education with every student that enters her class. She challenges us to be the best possible teachers we can, and it does not stop there. She challenges us to contribute to our communities, and take advantage of all opportunities given." Prior to entering higher education, Marley taught at Queen Palmer Elementary School, Carmel Middle School, and Fountain Valley in El Paso County as well as serving as an instructor in the Teacher in Residence Program with Pikes Peak BOCES. She was the director of player development with the United States Field Hockey Association in 1994 after earning a trip to the NCAA Final Four as an assistant coach with NCAA Div. I University of Massachusetts. She has served in a variety of capacities with the U.S. Olympic Committee. Earlier this Spring, Marley won the new Excellence in Non-Tenure Track Teaching from the University, receiving a whopping eight nomination letters, which praised her involvement in the community, and promotion of real life experiences, and professional development with her students. Marley coordinates with departments across campus to use her students as help with many hands-on life experiences from football games to Discovery Days and the Let’s Move program, which offers children in grades K-8 a day to experiment with various kinds of healthy activities. According to nominators, she consistently stays up to date on the latest research in her field and creates programs that significantly impact the health of Pueblo youth. She challenges students intellectually by having them examine real life situations. As the events manager for USA Field Hockey for 30 years, she has used the position to take students around the country to view and participate in the organization’s operations. Her students receive experiential education and valuable experience for future careers in real work settings such as event management at both CSU-Pueblo and state championship sporting events. Students appreciate that she allows them to learn from their mistakes before trying to correct them and that she challenges them to leave their comfort zones and explore new possibilities in both their educational endeavors and life choices. Marley earned bachelor’s and master’s degrees in health, physical education and coaching from West Chester State University (Pa.) and a Master of Arts in Supervision and Administration from the University of Phoenix.